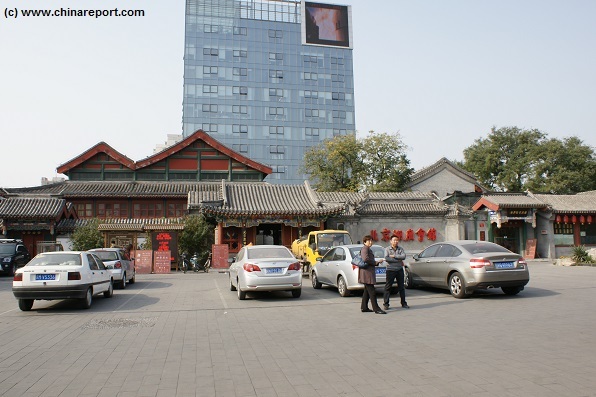 In the past decade all of Chongwen- and Xuanwu Districts has been redeveloped wiping out the surrounding Hutong and replacing them with apartment towers and glass office buildings such as can be seen immediately to the west of Huguang Guild Hall. In the original situation the theatre was surrounded by low rise Siheyuan and stood out among these. 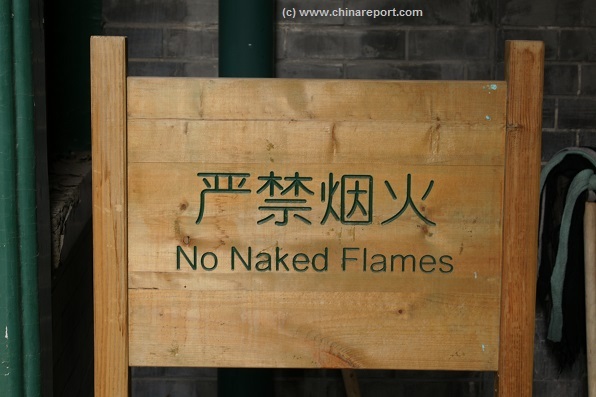 Welcome to China Report's Digital Introduction to the Huguang Guild Hall, in the Xuanwu District of Beijing. The Huguang guild Hall is not a major hot spot for international tourism, yet nevertheless, it is considered a location of great historical importance, and as such it is high level protected landmark of the city of Beijing. The front of Xiangxian Temple which can be found on the north side of a 2nd small inner courtyard of the complex facing the southern side. AsiaReport.com generated Google Map Overview of the location of Huguang Guild Hall just south off Nanxinhua (South New China) Street in the Xuanwu District of Beijing. 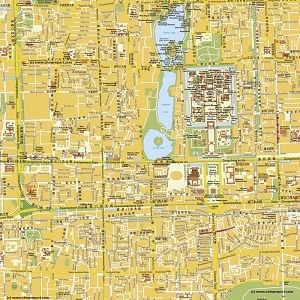 Very accurate and up to date Map of Beijing City Center , complete area of the Palace Museum (Forbidden City), Square of Heavenly Peace, Beihai (North Lake) Park, the South and Middle Lakes (Zhongnanhai) and area's of surrounding districts of Xicheng, Dongcheng, Chongwen and Xuanwu. Map detail includes names of alley's (Hutong) and even side alley's. Map clearly marks the location of all Landmarks, Historic Monuments, hotspots and various sites of interest within the map area. Please browse the map and follow the links to additional information, maps and photo's of each location and site. Traces of early 19th century architecture can still be found along South New China Road (Nanxinhua Jie) and less so in the fully restored i.e. modernised Qianmen South Boulevard. Huguang Guild Hall is unusual to its surroundings in that it was designed in a traditional Chinese Style, somewhat unlike surrounding structures, all of which have the more modern but also stern look of the Colonial Era of commerce, banking and global trade development. Although today one would hardly notice, in its heydays the Huguang Guild Hall was ranked among the 4 most famous Peking Opera Theatres in the city, which by itself was the most glamorous, posh and popular art of the time. As one may find upon closer study of the history of the art of Peking Opera, what today seems like a modest type complex surrounded by increasingly higher glass and steel towers, was known as one of the "Four Great Theatres" in all of Beijing and it was major location in the up-scale social life in the city. Front exterior of the Huguang Guild Hall and the small modern square in front of it. In the background structures of the adjacent movie theatre. Dow to its low height and reduced profile in the current day situation Huguang Guild Hall is easy to overlook. cultures and memories associated with it. Read more of the history of the theatre below for a fuller experience. In case you have grown curious and would like to share a taste of what still is an exquisite little experience, make your way through the chaos and traffic of the Xuanwu District to Nanxinhua Road to scout out the location and have a browse about. During daytime hours not much will be going on and you could explore most of the complex as long as one keeps the proper respects. For the full experience, arrange for an evening dinner experience with a high quality peking opera show, which is todays speciality of the Huguang Guild Hall. Afterwards and at any time, you might want to stroll about the neighborhood heading north or nothwestward while keeping an eye out for additional architecture dated to the same era. Fans of the art of Peking Opera and those in love with the history of Beijing must visit at least once. When, tickets to the Peking Opera shows given at the Guild Hall are sold, those eager to try and approach the experience may refer to the former sister theatre of Huguang Guild Hall, the almost equally legendary Zhengyici Theatre, which is the one remaining Peking Opera Theatre housed in a historically original traditional Qing Dynasty Era Temple. The physical distance between the two theatres is actually quite large, however historically the two are intertwined forever. 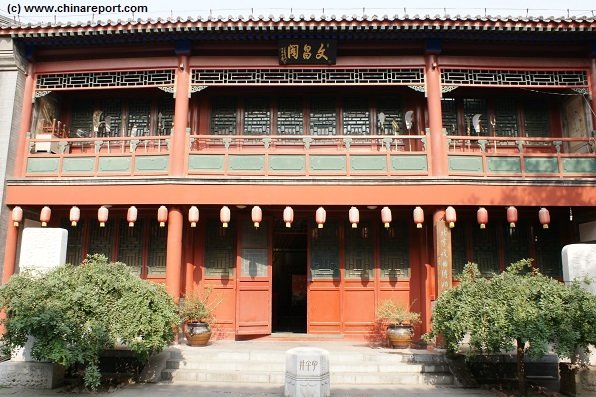 The Huguang Guild Hall is the only remaining traditionally styled building in this area of the city of Beijing. Its exterior fully restored and well maintained it serves as a restaurant in evenings. The Huguang Guild Hall and historic Peking Opera Theatre is situated at Luomashi, which is a subdistrict or area on the northern rim of the Xuanwu District. Another way to put its location would be to say it is it is one block west of the Zhushikou Intersection (which is where Qianmen Dajie and Zhushikou Dajie intersect). 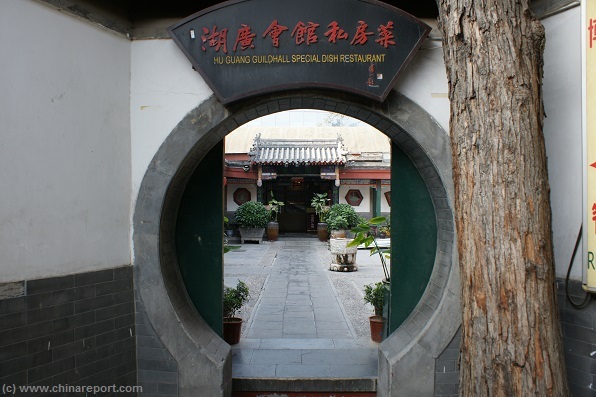 However, for those unfamiliar with the city it would be easiest to describe the exact location of the Huguang Guild Hall as immediately off the south end of the now popular tourist magnet annex upscaled shopping street know as Qianmen Nan Dajie or Qianmen South Boulevard). For best understanding, please refer to the available maps to guide your way to the destination. 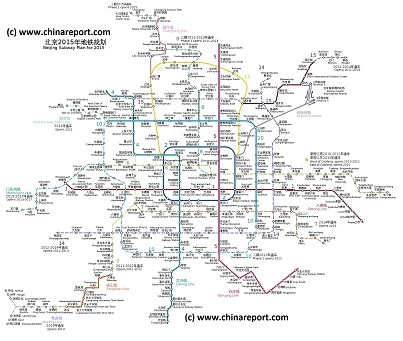 When stuyding the map of the subway metro system one may find that Line 7, east to west and vice versa passes through the Zhushikou and Hufangqiao Intersections, which are situated one block to the east and one block to the west of Huguang Guild Hall. Choosing the subway/metro sytem as you easiest mode of transportation around the city, this leaves a walk of one city block to end up there. Dajie and the Tianqiao Intersection where one will find the legendary Wansheng Chinese Acrobatics Theatre (or one could do the reverse route). 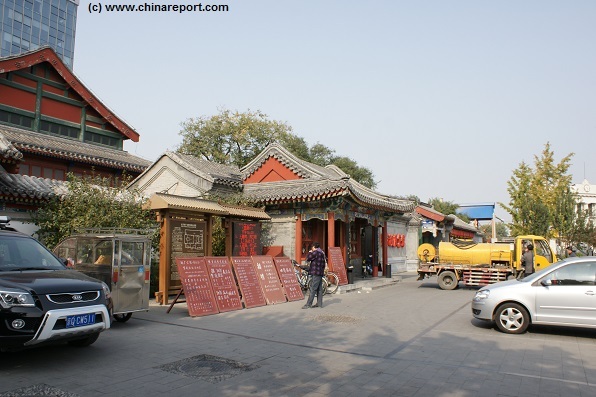 This route can also be hiked for a city exploration adventure, however please do mind, distances within Beijing are often more than they seem to be on a tourist map. In case, at the very least, make sure to pick the correct day without abundant heat or opposite negative weather features. deliver an equally stunning however slightly less original or historical experience. Those who quite frankly could care less about Peking Opera but are in search of the political monuments hidden abouts the city may do better to head westwards to Caishikou where a number of former residences of politically important persons may be found situated and where there is another Guild Hall, the Hunan Guild Hall which is also a national monument. 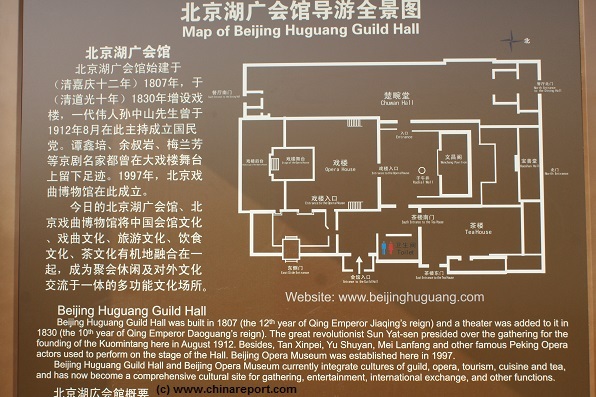 Huguang Guild Hall is however the only Guild Hall in the city to also include a Peking Opera Stage and Hall. Not too much information can be given on the architecture of Huguang Guild Hall. Constructed in 1807 AD, it is a traditional Chinese style building. Large parts of the building consist mainly of wooden parts which have ben joined together without the use of nails therfor no smking is allowed inside at any time. Exterior decorations include carved stone, colorful traditional patterns, brackets and upturned eaves, small roofline bells and traditional red paper lampions to brighten up the evenings and attract attention. Rough map of the lay out of the Huguang Guild Hall complex as displayed at the front of the building. main buildings of the hall include the opera building on the south side, the center of which is of course shaped by the stage. 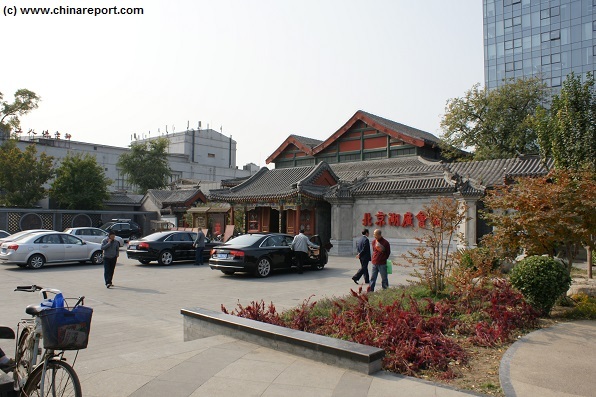 Then there are the Wenchang Building , Xiangxian Temple and also a small courtyard with Chuwan hall on the north side. The Peking Opera theatre -today the crowning piece of the restaurant dining experience, is renowned for its magnificent interiors, which is colored in red, green and gold, and decked out with tables and equipped with a stone floor. 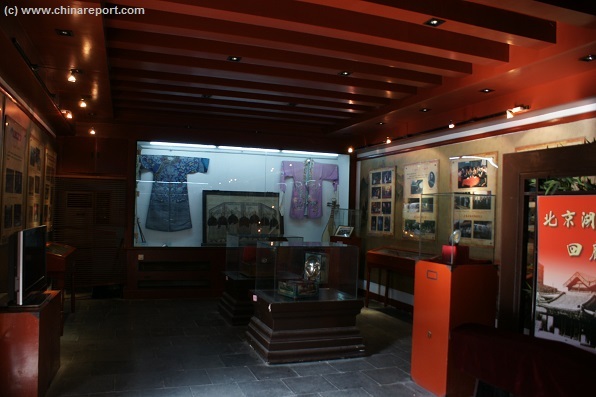 Housed inside the structures is a small tea house and since the year 1997 the Huguang Guild Hall also contains a small museum which exhibits the theatre's rich history of Beijing opera. Unfortunately however, the exhibition is by far not as rich as may have been possible, arguably, due to a lack of space rather than appropriate history. Also, make sure to hold your footing by wearing the correct walking shoes. Other than that, enjoy your visit and have a ball treasuring the occassion. As has been a longstanding tradition associated with the art and showmanship ofPeking Opera, Special Show announcements and upcoming plays are announced atsoude the front door during daytime and in advance of the show. Pick your favorite play to go and see it at the correct time. outside of the walls the area was accessible to nearly everyone, including people from all walks of life. Next to the much lauded traditional arts today enshrined as Peking Opera and Chinese Acrobatics, there were the temples and fortune tellers for solace, and sing song girls, prostitutes and bars for other cravings. In between were strewn various markets, some of which still exist today. In terms of entertainment and commerce, the entire area was a grandiose success, achieving more than just regional fame. In fact, as enshrined in local folk tales now recorded into little tourist books, around the time of the opening of the Huguang Guild Hall, the area was already so renowned for its fun and vices that it was rumored that even Emperors had secretly visited to indulge in the glories of the Beijing nightlife to be found in the hutong areas south and outside of the city wall gates along the central axis of the city. As the Huguang Guild Hall stood and had its spectacular shows involving the absolute stars of the art. Prior to its opening, the location of the Huguang Guild Hall and Opera Theatre had already been occupied. Originally, the building was used as a home mansion for various officials during the then ruling Qing Dynasty. Only subsequently, the building had a structural overhaul which transformed it from private luxury living space into its current form, that of a lavish theatre. The current official opening date does not as much refer to the establishment of this location as a meeting place for various members of the going elite (not only royals but also officers, officers and literati). It was only after its establishment that it also became a haven for political activists. Scenes from the interior lay-out of the Huguang Guild Hall. On the inside the complex seems alike a venerable little palace such as one may find within the northern parts of the old inner city, although of course the Royal Mansions such as that of Prince Chun are by far more spacious, lavage and luxurious in decorations, materials and designs. Until as recent as the year 2005 surrounded by miles upon miles of Hutong lanes, the theatre formed a spectacular palace surrounded by a world of greyish slums and an abundance of people packed together in what amounted to the lower class neighborhood of the otherwise elitist and regal city. 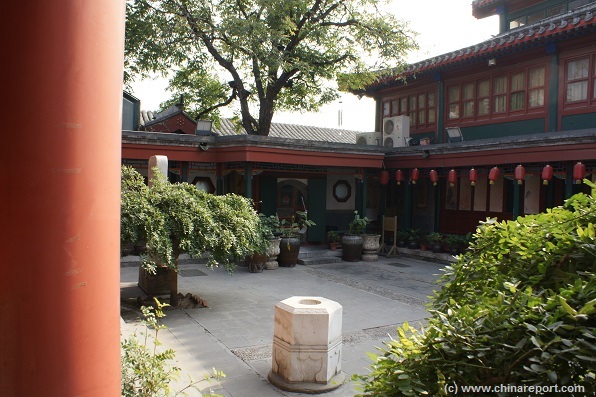 Overview of the neatly kept main inner courtyard of the Huguang Guild Hall. current arrangement of halls- was established in the 10th year of the reign of Emperor Jiaqing of the Qing Dynasty (1807 AD). The Huguang Guild Hall then derives its name from an original function, which was the gathering place of students from the provinces of Hunan and Hubei who in a 4 yearly rotation, were bound for imperial exams in Beijing, where they were to attempt their successful entry into the world of Government officialdom and hopefully fortunate future as a member of the upper strata of society within the nation. 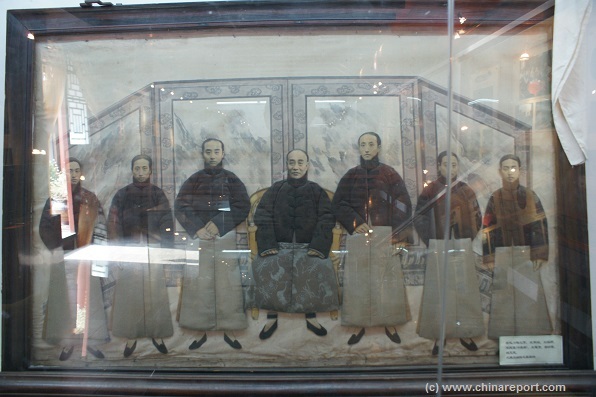 Families paid handsome money for their son to achieve such a feat, therefor, as the sons of the well to do arrived for their stay in the city, finding lodgings in the surrounding siheyuan and hutong areas, the Guild Hall served an important central guest house and reception point of finances to pass into the city. In between, when the from Hunan and Hubei were off within their provinces, the Guild Hall soon became a favored haunt of businessmen and cultural elites. In a time when the Qing Dynasty was under pressure however the cultural life of Beijing was still in its heydays, the hall was noted for its profound cultural creations and excellent Beijing Opera culture tradition. In 1912, the statesman Sun Yat-sen visited the Huguang Guild Hall five times to deliver political speeches. On August 25, 1912, he presided over and held the Founding Conference of the Kuomintang. Subsequently, during the years of the Republic of China, the Huguang Guild Hall was the favored stage of such opera masters as Tan Xinpei, Yu Shuyan and Mei Lanfang. Other great stars such as Chen Delin and Wang Zhijun also performed there. The success of the theatre lasted well into the 1930s, however after the city fell under the influence of Japanese Invaders slowly but steadily encroaching from the north, intellectuals, artists and renowned local celebrities disappeared from the scene scattering to cities across the nation and often -albeit temporarily- seeking refuge in overseas nations. With the dying of tradition and cultural life in the city, the theatre slowly fell from grace starting a long period of waiting for renewed attention from a fresh public. 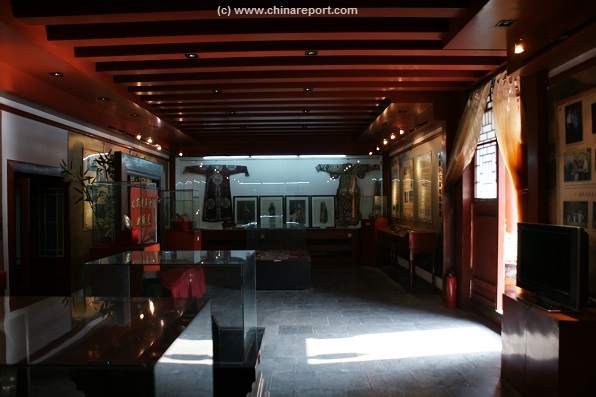 Overviews of one small hall holding the Peking Opera Museum attached to the Theatre at Huguang Guild Hall. Although the theatre has a grandiose history, the exhibit only has sparse materials and not much information, especially not for other language visitors. The legendary grand masters of the art of Peking Opera, forever remembered as the modern founding fathers of the art. The master played at Huguang Guild Hall and also the Zhengyici Theatre near Liulichang Street and the now demolished Heping Gate (Hepingmen). who played with which performance when, or even what the highlights of decades of top quality Peking Opera were exactly, but each master is known to have had his own style type and use of techniques as well as what their favorite plays were. As is widely known, Mei Lanfang (almost) exclusively played the Dan type of role, which is a female role played by a male actor, a legacy left over from nearly a century of Imperial Ban imposed on women acting and working in Peking Opera theatres. 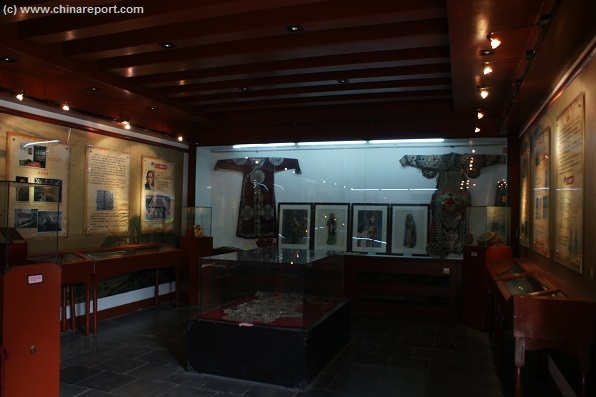 Browse about the museum hall to have a further look at a small variety of historical photos and inspect altogether 4 antique Peking Opera costumes which are on display shielded from touch by a thick fiberglass wall. a few relic objects are there as well and a small audiovisual display completes your museum and historic introduction on the spot. theatres. The truth is that the real museum is actually the restored Peking Opera Theatre Hall which one can best the various intricacies and decorations one may best review by simply joining one of the evening performances and having a browse about before or after the show The Peking Opera stage at Huguang Hall is only comparable to that of the oldest wooden theatre in China today, which is the sister theatre, the Zhengyici Opera Temple. Other such stages do exist but all of these were part of Imperial Mansions (Prince Gong Palace) and even the various Imperial Palaces (the Forbidden City, later Zhongnanhai, the Pavilion of Cheerful Melodies at the Qianlong Retirement Palace (Palace of Peace and Longevity), at the Summer Palace Yiheyuan etc) however such halls were not by far as open to the public sphere as were the Huguang Hall and the Zhengyici Theatre. Fallen into disuse after the advent of the Peoples Republic of China, which soon ended commerce and gradually launched more and more vicious attacks against the art of Peking Opera, the historic theatre lingered in obscurity between the downtrodden workers in the Hutong of the Xuanwu District, to who it was still a temple and place which reminded them of a bygone era of far less austerity in all aspects of the public sphere. Surviving the cultural revolution era mainly due to its historic legacy as the birthplace of the founding party of the first Republic led by Sun Yat-Sen, a man lauded in numerous Communist Propaganda publications, the theatre lingered for yet more than another decade with little interest forthcoming from the local public. Meanwhile, in a brief era of unusually progressive thinking among the party leadership (specifically Hu Yaobang, former Party Secretary fallen from grace soon after), in order protect the precious heritage resource left over from a turbulent century, the Beijing People’s Government finally declared Huguang Guild Hall as a culture relic protection site of Beijing in May 1984, finally returning some recognition to an art and an era which helped shape the Capital City as well as the Nations political life. 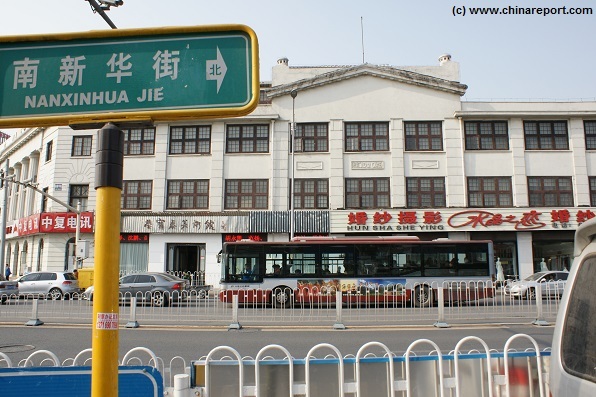 Chief Architect of Municipal Architecture Design Institute, put forward the proposal of reconstructing Beijing Historical Guild Hall into an Opera Museum, which aroused attentions of leaders (among the Jiang Zhemin a known Peking Opera enthusiast) who investigated Huguang Guild Hall and made the decision to restore it later. Through efforts of people from all walks of life over ten years, the restoration of Huguang Guild Hall was completed in April 1996. On May 8th of the same year, Beijing Huguang Guild Hall was open to the public. The grand opera house was represented with antique colored drawing by workers through careful investigation and study. There is a tablet inscribed with “Nishang Tongyong” that means to sing and enjoy opera together, the couplets on the massive pillars are about 5.3m, the first line of couplets was written “To have an audience with Royal Court, majestic and grand like in Hunan and Hubei” and the second line was written “To sing and dance, delighted and cheered for the profound literature and art”. There are square tables of antique beauty arranged neatly at the two-storey auditorium, a more comfortable environment for audiences. It remains the original architecture style that is plain and elegant with spacious attic, carved beams and painted rafters, winding path, and becomes beautiful scenery in the southern part of Beijing. Through long-playing collection of cultural relics and intense preparation, Beijing Huguang Guild Hall was declared to be established as the 100th museum of Beijing [i.e. Beijing Traditional Opera Museum] on September 6th, 1997. The reconstruction of Huguang Guild Hall brings new attractions to Beijing, not only develops tourism resource, but also is conducive to education in patriotism for teenagers. Huguang Guild Hall was listed as one patriotism education base of first batch by Xuanwu District Party Committee and District People’s Government. YouTube Video: a rare video allowing for a view of the main Hall and the Peking Opera stage and show at Huguang Guild Hall Beijing. 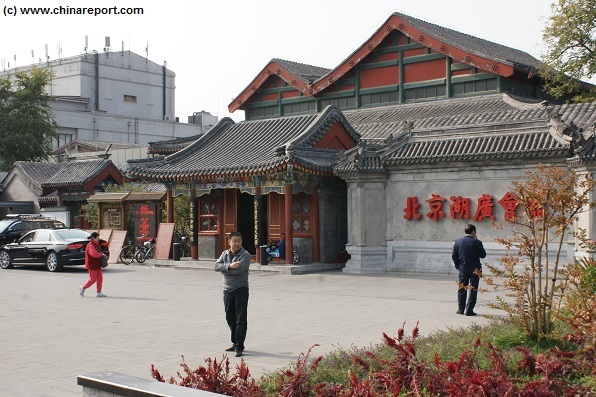 Huguang Guild Hall or find one at the other historic wooden hall, the one at the Zhengyici Peking Opera Theatre. Its name as one of the finest theatres in Beijing reestablished in the most recent situation the classical stage not only sees Peking Opera but has also become a preferred venue for artistic expressions and presentations. In addition to Peking Opera there are also shows of the so called art of crosstalk.